For day four of the Blogger's Christmas Beauty Brawl I decided to review a mascara I received recently. 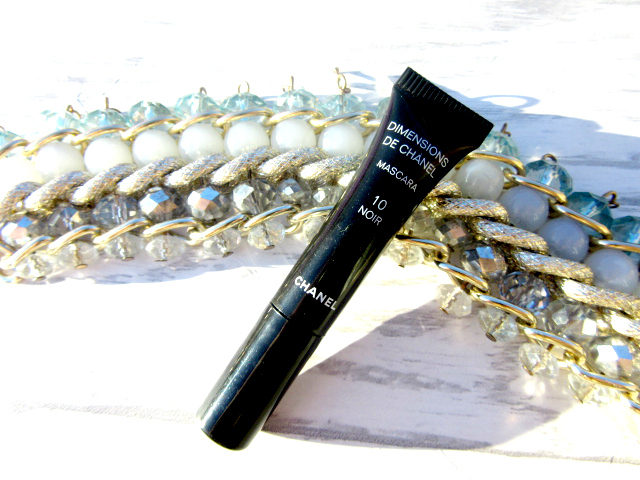 As you can see in the picture below, it's only a sample size of Chanel's Dimensions de Chanel mascara, but using these are great if you want to try a new higher end mascara without forking out the luxury price tag. You can usually pick these up in-store or occasionally online for free so you can be sure whether you like it before you buy it! PRODUCT QUALITY: Being a Chanel product, the mascara is of a pretty high quality so I was excited to try it out. For me, I found this mascara really separated my lashes (which is great as I'm not a fan of thick, clumpy eyelashes) and made them look much longer. The mascara is a true black in colour and I found my lashes were still looking good by the end of the day. PRICE: This mascara usually costs £25 which is pretty steep but what else would you expect from a luxury product?! I'm not sure I'd buy the full sized version for myself, but it would be a fab high end gift for someone else. PACKAGING: In terms of the full-sized packaging, it's fairly standard Chanel black with a gold band around it. It looks elegant but in my opinion I wouldn't say it stood out to me. However on the plus side, this sample version is a great little product to travel with! OVERALL VERDICT: Don't get me wrong, I do really like this product, but for now I think I'm going to have to stick to my high street roots and say I don't think I could justify the price of this mascara! Great as a little sample to travel with but I'm sure there are high street mascaras that are almost/just as good as this one.